Your summer staple wedge is here! 4004 by Jose Saenz is stylish, very versatile and not to mention comfortable! The padded insole makes this wedge a breeze to walk on and the black and white patterns makes this wedge one that can either stand out or blend in with any outfit! 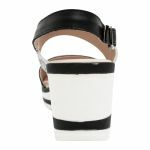 With elastic gussests on the inner strap and an adjustable ankle strap this wedge is going to fit perfect every time!